“When they try to boycott us, we must be united" and buy products from Judea and Samaria, says Shas chairman. 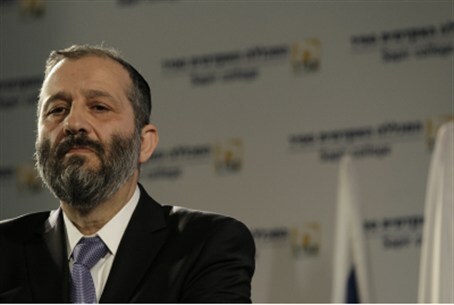 Shas chairman MK Aryeh Deri on Wednesday spoke out against the European Union’s plans to boycott Israeli companies which operate in Judea, Samaria, eastern Jerusalem and the Golan Heights. Deri called on the entire Israeli public to stand behind these companies and purchase their products en masse. Setting his own example, he purchased oil from the community of Shilo. "In light of the attempts to boycott products from Judea and Samaria and prevent funding and scholarships from our fellow Jews living in certain parts of the Land of Israel, and especially now with recent mass layoffs, I chose to buy ‘blue and white’ olive oil for Hanukkah in the Jewish community of Shilo,” said Deri. “When they try to boycott us and hurt us, we must be united, the few against the many, to continue to keep this nation strong and united,” he added. On Tuesday night, Israel and the European Union (EU) reached a compromise on wording for Israel's participation in the "Horizon 2020" European scientific collaboration project. The joint project was thrown in jeopardy by new EU guidelines that boycott entities over the 1949 Armistice line. Intensive phone conversations between Minister of Justice Tzipi Livni and EU Foreign Minister Catherine Ashton finally led to the breakthrough. Minister of Economy Naftali Bennett and Deputy Foreign Minister Ze'ev Elkin were also involved in the discussions. In the compromise the EU will note in the agreement that it does not recognize Israeli activities over the 1949 Armistice line and is not prevented from its new boycott guidelines, while Israel will attach a section emphasizing that it does not see in the EU's stance an obligating legal precedent. Israel warned that it might shun the key EU research program unless a compromise is found over the boycotting guidelines. EU officials had been visiting Israel recently in an attempt to ensure the continued cooperation between the Jewish state and the 28-nation bloc, but the EU rejected Prime Minister Binyamin Netanyahu's previous compromise attempts, leading him to call an emergency meeting on Monday. After the meeting Livni reportedly asked Netanyahu to speak to Ashton and persuade her to soften the European position.